The Baekdu Mountains or Paektu Mountain (Korean: 백두산맥) are a range in the northern part of North Korea spanning the provinces of Ryanggang and Chagang that are of huge symbolic importance to many Koreans. An easier (and less restricted) option to visit this area is to go to visit the Changbaishan National Nature Reserve on the Chinese side of the border. This region takes it name from the Baekdu mountain range (also known as the Changbai Mountains) which spans both provinces as well as the Manchu province of China. The area is highly mountainous with many peaks exceeding 2,000 m. The highest peak is Mount Baekdu which is one of the most popular visitor destinations in North Korea, and also what many Koreans consider their mythic origin. The region shares a long border with China, partly formed by the Yalu River and Tumen Rivers. While Chagang is rich in mineral resources Ryangang, to the west, is one of the poorest provinces. Air Koryo has regular charter flights to Samjiyon (삼지연군), for tours to Mount Baekdu and, thanks to tourist dollars, they are a fairly frequent occurrence. There is a combined military and civilian airport in Kangye, since it's also connected to Pyongyang by a road and a railway serves a transportation hub for the western part of the region. The only regional transport you're likely to be able to use is a government provided bus at the airport in Samjiyon. International Friendship Exhibition Hall, Myohyangsan. Located in Myohyangsan this is one of the country's most famous sights, showcasing gifts given to the leaders of the Democratic People's Republic by foreign dignitaries, to demonstrate how the leaders are widely admired and respected. Pegae Hill. A camp site of the Korean People's Army during the Japanese occupation allegedly led by Kim Il-sung. 41.992778128.0772221 Mount Baekdu (백두산 in Korean, 长白山 or Chángbái Shān in Chinese). 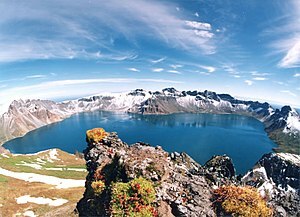 An active volcano which last erupted in 1903, with a vast crater lake at its centre, it's the DPRK's highest mountain at 2,744 m (9,000 ft), and also of huge mythical importance to Koreans. The huge crater lake called Chonji ("Lake of Heaven") lies at the summit, surrounded by bare rocky crags. It is one of the deepest alpine lakes in the world, and also one of the coldest. The Chinese side of the mountain, which occupies half of the caldera lake as well, is a lot more accessible and much more inexpensive to visit than the North Korean side. Baekdusan is sacred to all Koreans, because according to Korean mythology it is where the 'Son of the Lord of Heaven' descended to earth and the first Korean kingdom began. The mountain's mythology has been appropriated by the DPRK's recent leader, Kim Jong-il, who claimed the mountain as his birthplace as well. Mount Baekdu is an active volcano that last erupted in 1903. Experts believe that the volcano will erupt every 100 years or so, and therefore it is due for another one soon. This region travel guide to Baekdu Mountains is an outline and may need more content. It has a template, but there is not enough information present. If there are Cities and Other destinations listed, they may not all be at usable status or there may not be a valid regional structure and a "Get in" section describing all of the typical ways to get here. Please plunge forward and help it grow!